Elon Musk has had it with you guys. Over to YouTube. Tesla Inc.’s first-quarter earnings report began on a reasonably positive note Wednesday evening, as the company’s adjusted net loss of $3.35 a share beat the consensus forecast by 6.5 cents per share, or $11 million. As so often, that beat — or rather, smaller loss —came courtesy of selling a slug of zero-emission vehicle credits, which added almost $50 million to the bottom line (see this for an explanation). Still, the stock initially went up in after-hours trading. But things got a little less warm and fuzzy just over half an hour into the results webcast. 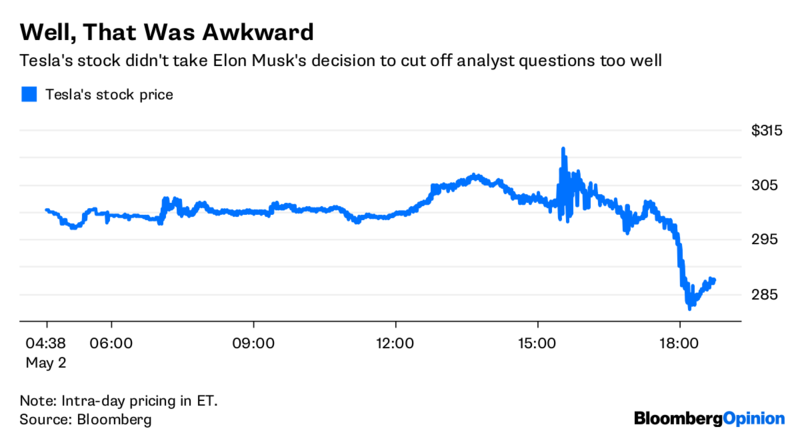 Despite saying initially that he was up for a long Q&A session, Musk cut off analyst questions, complaining they were “so dry.” That’s when he fired up a YouTube channel to take questions from retail investors (something that was arranged this week over, what else, Twitter). Analysts had been asking boring questions — and that’s boring in the sense of tedium, not tunneling — about Model 3 production, automation, gross margins and the like. Early on, one analyst had pointed out the apparent disconnect between Tesla moving to a 24/7 production schedule to get to 5,000 Model 3s a week and the company’s ambitions for productivity (something I wrote about here). Part of this reflected the boost delivered by working capital movements in the fourth quarter inevitably unwinding. In any case, the result was a $702 million drop in Tesla’s cash balance to $2.67 billion and a $1.05 billion increase in net debt. 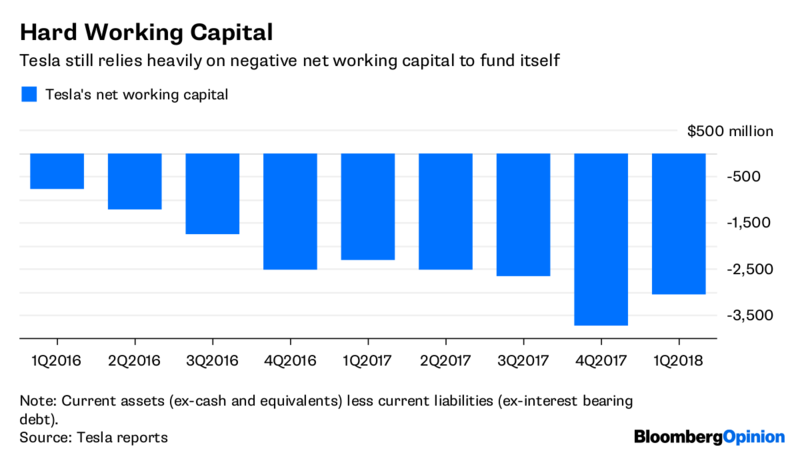 Net working capital is still negative to the tune of $3.05 billion. Besides the webcast’s awkwardness, the strain also shows in Tesla reducing its guidance for capital expenditure this year, from $3.4 billion to less than $3 billion. This is surprising, given the ongoing issues with the Model 3 and Tesla’s other projects in the pipeline, such as the Model Y. To be clear, shrinking the budget is the smart thing to do when cash is this tight. But it also looks unrealistic in the context of a business whose entire valuation is predicated on rapid expansion. It also doesn’t look like enough. 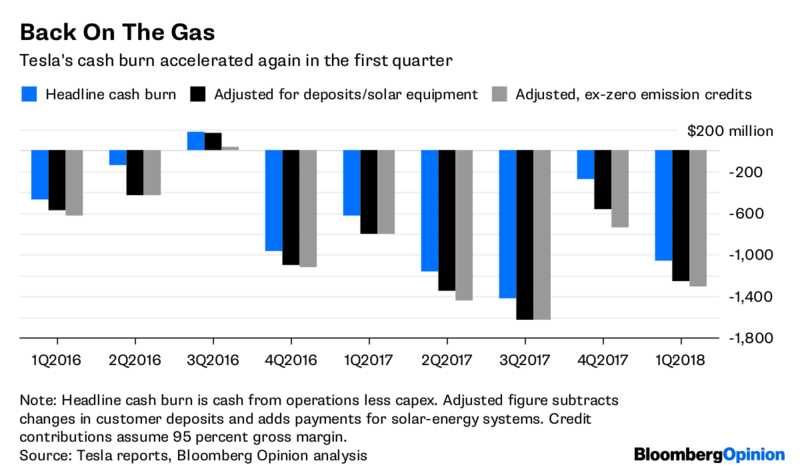 Tesla’s new guidance implies capex through the rest of the year of about $2.3 billion, which would take most of its remaining cash. Now, of course, analysts forecast Tesla to generate about $980 million of free cash flow through the rest of the year (though maybe they’re revising that, having been freed up from the webcast). Even assuming that number holds, though, it implies a year-end balance of about $1.3 billion – a very thin cushion for anything unexpected, such as, for example, problems with the Model 3. Tesla still maintains it will get the Model 3 going, achieve profitability and avoid another capital raise later this year. Belief in that despite the company’s track record on guidance rests, as ever, on a belief in Musk. This is also what underpins the ultimate redoubt of the bulls: namely that, if there is a cash crunch, the company can tap that stratospheric valuation to raise more money. And that’s the real problem with Wednesday’s update from Tesla. In cutting off the tough — sorry, “dry” — questions, Musk may have done more to shake confidence in the company than any set of bad numbers could.